I hope you are well! I am so happy to be collaborating with Stylish Fabric on this and more DIY looks to come! Stylish Fabric is an online fabric store based out of Los Angeles and they offer a variety of fabric. Initially, I had my mind set on making something wonderful with a bold printed woven fabric that I saw online, that is until I started looking at the vast amount of lace they have to offer! 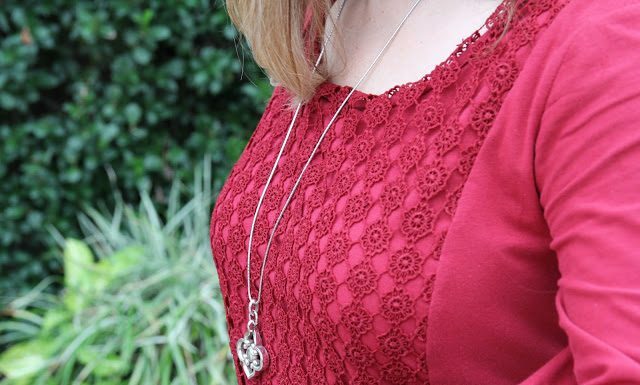 While looking at the stretch lace options, I was reminded of my favorite lace and jersey RTW t-shirt that I have been intending on copying for over a year now. This led me to look at their offerings of jersey knits and let me tell you, they have an equally vast amount of jersey knit to pick from. Not only is there a wide selection of colors, but they have jersey knit in rayon, modal, viscose, etc. If you look at the fabric contents on the labels in some of your favorite RTW knits, you may see these contents listed. After looking through the laces and jersey knits, I decided that I wanted to do more than just copy my favorite t-shirt, but I wanted to play around with these fabrics and colors to create a few really cool and casual spring/summer looks. So let’s get into this week’s DIY look! 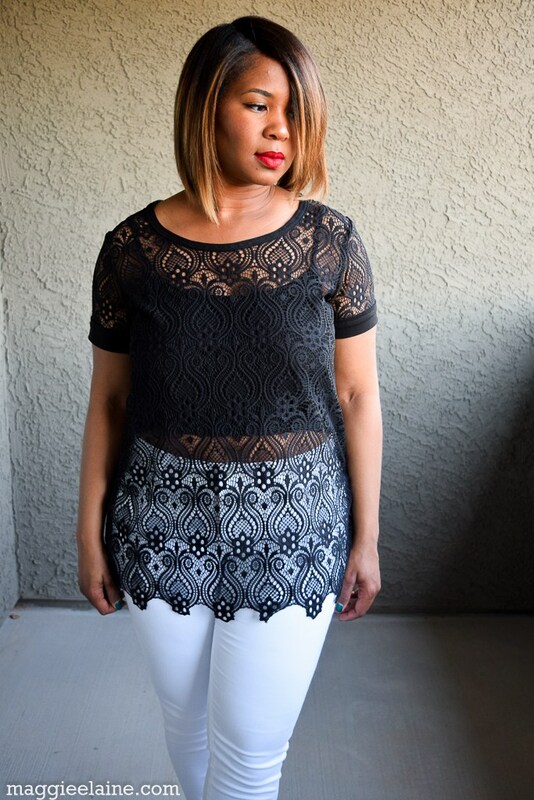 To start off my lace and jersey series, I would like to start with this really fun stretch lace top that I made with a black vintage-inspired Lourdes Princess lace. The design of this lace is stunning. It is a very nice quality lace made of 90% nylon ad 10% spandex, so it has a nice amount of stretch. This lace comes in so many fun colors. I also have this in seafoam green. There is a ton of possibilities for lace including tops, dresses, lingerie, etc. If you are interested in purchasing some of this lace and/or any other fun fabric from Stylish Fabric, they are offering 15% OFF site-wide purchase if you use my coupon code. Click here to shop and be inspired! *Stylish Fabric offers domestic and international shipping (see shipping terms and conditions). This top was easy and fun to make! I am so excited to talk about the details! 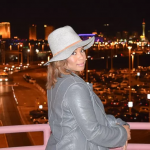 I have a sheer and lace blouse that I love wearing, except it is long-sleeved and is a bit more appropriate for going out in the fall/winter months here in Las Vegas. So I decided to make a spring/summer version of the top with this black lace. I picked up Butterick B6216, because View C seemed to be the perfect pattern for what I wanted to make, with the enclosed scoop neck front and split open back. I left the back panel off, because I wanted to keep the back of the top open. If you have worked with lace before, you know that sometimes you can buy lace with beautiful scalloped edges along the selvage like the blue middle lace shown here (by the way, these are the other fabric choices I will be working with next, soooo pretty)! However, not all lace will have these scalloped edges. I have “played” with lace enough to know that there are many possibilities to do your own thing with it as long as you are careful! This lace is GORGEOUS! However, it is one of those laces that does not have scalloped edges, but it’s okay , because I made my own! First, I tested things out on a piece of the lace to determine where I could cut and where I should not cut. 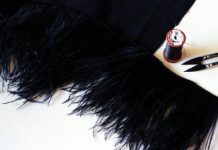 It is really important to determine the level of fraying factor that your lace may have as well as figure out where you can cut the lace without it unraveling. Once I figured I could cut my scallops successfully, I cut out my pattern pieces, making sure to leave excess fabric beyond the pattern pieces to make the scalloped edges. I did not want to cut in places that I refer to as “critical connections” on lace that would cause it to unravel and come apart. I saw that I could cut all of these parts without the lace unraveling or fraying, but I could not cut these connections between the scallops that I am pointing to for the look I was going for. I used my trusty curved scissors, which are pretty sharp, to get as close as possible without cutting into the scallop. I find that curved scissors are so great for snipping off thread and small things like this. The curvature design allows you to cut very close without it cutting deep into your fabric. After I cut out my scallops, I took a small brush to lightly apply and treat the cut edges of the scallops with Fray Check on top of a piece of paper. I hung my fabric pieces up to dry completely. I did not over saturate the edges with Fray Check, because this stuff hardens the edges. I did not want my edges to be super stiff of feel like sandpaper against my skin or other garments. I waited a few hours to ensure all of my pieces where dry, and lightly pressed and steamed the edges with a cloth between the iron and lace. Next I started sewing! On the shoulders seams, I stitched in a strip of clear elastic to give the lace a little support to handle stretching and wear. I see this done a lot on RTW stretch garments. I stitched the sleeves using the flat sleeve insertion method instead of setting the sleeve in. If you are interested in this method, I am sure you can Google or find videos on You-Tube. There was no need for me to bother with a gathering stitch on the head of the sleeve, because I was able to stretch the fabric into place while I stitched. I stitched this top together with a zig-zag stitch, but I serged my final seams. Below is a picture of the serged shoulder seams. I wanted the pattern of the lace to align where the fabric overlays in the back to keep it in place. I thought the design of the lace would look sloppy like in the picture below. To align and keep the overlay together, I tried something out. I attached my free motion quilting foot and dropped the feed-dogs on my machine and zig-zag stitched several spots on the lace to keep the design taut and in place. With the foot and dropped feed-dogs I was able to freely move the fabric around in different directions under the needle while stitching around the design. I was so lucky that my fabric did not jam or get stuck, but I took my time and was careful. Sewing takes A LOT of patience sometimes. Recently, I became the owner of a coverstitch machine and I used it on this top. Using scrap knit, I made double-folded bias tape to attach around the neckline. I attached the bias tape with my coverstitch machine using two needles. In a sewing machine class, I learned about other types of threads that could be used for projects. One of the threads is wooly nylon. This thread is a stretchy thread and is great to use in the upper or lower looper of sergers or coverstitch machines for all sort of knits or activewear. There are various types of wooly nylon or “wooly-like” thread. Which one you use depends on your project. Some wooly nylon threads have a melting point under a hot iron, while “wooly-like” thread made of polyester does not. The stretch and coverage can be different between brands and types. I used wooly nylon thread in my lower looper only and regular polyester serger thread for the rest. Success! I picked up a knit RTW cami top from Walmart for less than $3.00, to use as a front insert for the top. I cut the back of the cami off and connected the insert to the lace top at the shoulder strap and side seams. I bought it 3 sizes larger than my normal size, because cami knit tops are fitted. My lace top is more loose. Therefore, I wanted to make sure I would have enough width in the cami to connect to the sides of my lace top. I knew a cami my size would fit too close to my body and would not reach to the sides of the lace top without major pulling! My theory worked. With the leftover fabric from cami top, I made wide sleeve bindings. I didn’t want my sleeves to be scalloped. I can’t wait to share more, don’t forget to go online to www.stylishfabric.com to shop for this gorgeous lace and/or any other fabric and use my coupon code to receive 15% OFF site-wide purchase of your purchase! Until next time, take care….